With Josh (Patrick Wilson) and Renai (Rose Byrne) still coming to terms with the death of parapsychologist Elise, the Lambert family move into his grandmother Lorraine’s home. However all is not well as Josh and Renai continue to experience the demonic forces that are set on turning their lives to chaos. With Josh’s increasingly bizarre behaviour, Renai is forced to seek help to protect her family and in uncovering the truth she soon learns the terrifying reality... Josh didn’t come back alone. Despite its critical and box-office success, we were never that taken with James Wan's 2010 Insidious, but we're prepared to give the boy another go, especially given the spiffy advance word on his recent haunted house horror The Conjuring. Yet despite its high IMDb user score, Insidious: Chapter 2 has not found the same widespread critical favour as its prdecessor, despite a smattering of very positive responses. Possible that we might like it, then. Either way, Insidious: Chapter 2 will be release on UK Blu-ray and DVD on 6th January 2014 by Entertainment One at the RRP of £19.99 for the Blu-ray and £17.99 for the DVD. 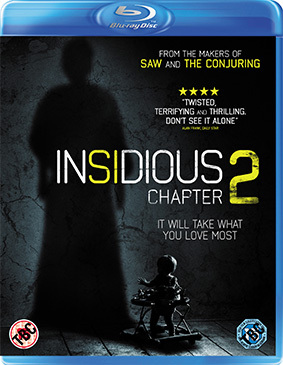 You'll also be able to buy a Blu-ray double-pack containing both Insidious films at the RRP of £24.99.